Bar Towels and Cloths from top selling manufacturers like BVT Chef Revival. Our restaurant supply cloths are the best on the planet for your commercial foodservice cleaning and wiping jobs. BVT-Chef Revival Herringbone Towel 15 in. x 26 in. BVT-Chef Revival White Flour Sack Towel 22 in. x 37 in. Bar Mop Towels - 24 Oz. Bar Mop Terry Cloth Towel - 30 Oz. Ribbed Bar Mop Towel - 28 Oz. Wiping Pals Blue Huck Towels - 10 Lb. Striped Bar Blue Towel - 16 in. x 19 in. Sertun SX-913 White and Yellow Sanitizer Towel - 13.5 in. x 18 in. Pro-Quattm Medium Duty Blue Foodservice Towel - 13 in. x 21 in. Pro-Quattm Medium Duty Red Foodservice Towel - 13 in. x 21 in. Pro-Quattm Medium Duty Quarter Fold Red Foodservice Towel - 13 in. x 21 in. Microban Medium Duty White with Red Print Foodservice Towel - 13 in. x 24 in. Microban Medium Duty White with Red Print Foodservice Towel - 13 in. x 21 in. Microban Medium Duty Blue with Blue Print Foodservice Towel - 13 in. x 21 in. Chix Plus Microban Heavy Duty White with Red Print Foodservice Towel - 13 in. x 24 in. Reusable Utility Linen and Terry Blue Towel - 13 in. x 21 in. All Day White with Red Print Foodservice Towel - 12.38 in. x 21 in. Quix Plus Sanitizing and Cleaning Multi Fold Pink Towel - 20 in. x 13.5 in. Quix Plus Sanitizing and Cleaning Multi Fold Green Towel - 20 in. x 13.5 in. Pro-Quattm Heavy Duty Foodservice Towel Red with Red Print - 12.5 in. x 17 in. 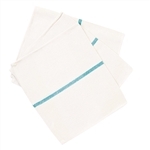 Foodservice Towel Blue with Blue Print - 12 in. x 21 in. White Food Service Towel - 13.5 in. x 24 in. Sport Towel White - 14 in. x 24 in. Striped Bar Gold Towel - 16 in. x 19 in. Wholesale Bar Towels and Terry Cloths for your restaurant or bar cleanup.